Donald Trump’s ex-campaign chief Paul Manafort has been jailed for 43 more months on charges stemming from the Russia investigation. It comes a week after the 69-year-old was given a 47-month prison sentence for fraud in a separate case. The latest sentencing arises from two conspiracy charges Manafort pleaded guilty to last year. He told the federal court in Washington DC that he wanted to apologise for his actions. “I am sorry for what I have done and for all the activities that have gotten us here today,” he said, speaking from a wheelchair. 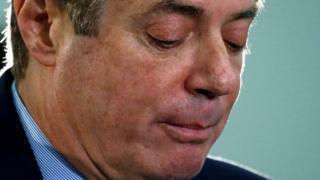 US District Court Judge Amy Berman Jackson sentenced Manafort to a total of 73 months, of which 30 were to run concurrently with last week’s sentence. Both cases stem from an inquiry into alleged Russian election meddling in the 2016 US elections. None of Manafort’s charges, however, relates to allegations of collusion with Russia. Mr Trump has always denied the charge, describing the inquiry as a witch hunt. Manafort’s jail term is the longest handed down since the inquiry began. “This case has taken everything from me already – my properties, my cash, my life insurance, trust accounts for my children and grandchildren, and even more,” Manafort told Judge Jackson on Wednesday. Before sentencing, Judge Jackson said it was “hard to overstate” the number of lies and the amount of fraud involved. Manafort pleaded guilty last September to two felony counts – conspiracy against the United States and conspiracy to obstruct justice – related to his lobbying. He also agreed to co-operate with Special Counsel Robert Mueller’s inquiry in a deal for a possible lighter sentence. However, just two months later that plea deal collapsed as investigators said Manafort had repeatedly lied to the government.